Create powerful Smart Dive Logs to browse your dives any way you want. Choose File > New Smart Divelog From the Menu. Choose New Smart Divelog from the Quick Action Menu in the Toolbar. Using the Smart Log editor starts out simple. Choose a field, a condition, and enter or select a value. For example, "Country", "Is", "Thailand". From there, you can go as complex as you like. Clicking on a "+" button to the right lets you add another condition. Clicking on a "-" removes that condition. The interface should be familiar if you've used similar things in iTunes or other applications. 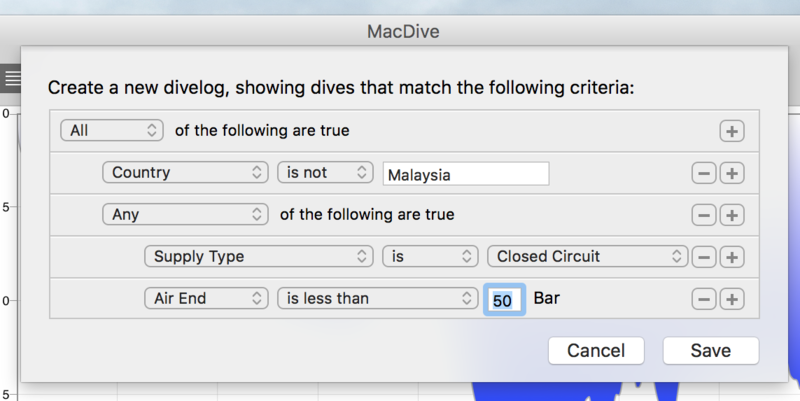 There are many different fields available, but please contact support@mac-dive.com if there's something missing that would help you organise your dives better! Once you're done, click Save. You will see Untitled DiveLog appear under Smart Logs in the sidebar, and you can give it a name right there. Clicking on the log will always show you an up to date list of the dives that match. If you want to edit an existing Smart Log you can simply right-click on it in the Sidebar and choose Edit DiveLog. The Smart Log editor will appear, preset to your existing log. Edit away and click Save when you're done. Similarly, you can right-click and choose Remove DiveLog to delete one you no longer need. You can duplicate Smart Logs by right-clicking on them and choosing Duplicate DiveLog. This will copy the Smart Log and give it a new name. You can then rename it and edit it to tweak values easily. This can be very useful for setting up multiple similar Smart Logs.